Sarah says they final get the backyard open and they’re locked in the Have nots room. Sarah – crazy how a few hours in here makes you feel out of it. Bruno leaves. the Girls thank him for getting them food and water. After Bruno leaves Brittnee and Sarah laugh, Brittnee smiles takes a bow. Ashleigh tries to make her feel better says Canada voted her a havenots because they held the power last week. Ashleigh makes it sounds thra Sarah has been in power and the viewers wanted a power shift. Ash says she could have been voted but she won HOH so maybe it was void. Pili and Ashleigh talk about a secret Veto, Ash doesn’t think there is one it’s too late in the season. They tell Sarah they’ve been looking around the house. Talking about how Canada put Sarah/Brittnee on Slop and solitary confinement. Godfrey saw Brittnee in the bathroom she looked pissed. Bruno asks if Ashleigh is decided to put up Brittnee. Bruno says the one thing they can count on is the girls coming after the guys they have to stick together. They are aware Ashleigh and Pili will win the endurance competitions. Godfrey and Bruno say ash/peels both said they will not vote each other out. Bruno brings up Sarah coming up to him saying she’s not proud at how she’s been acting from now on she’ll start talking in the open. Bruno – she’s always going in different rooms pulling people aside.. that is what she’s saying..
Godfrey – her mission will be to keep B off the block her second mission will be to get me out yo. They talk like Brittnee is a super threat in the game they need to get her out this week. Bruno points out Brittnee’s won 2 HOH. Godfrey says Brittnee is the best pawn in the business. They agree Sarah has to go next week. God thinks if Sarah wins the next HOH he can convince her to not put Bruno up but he can’t keep Zach off the block. Godfrey points out Sarah is so close to ASh/Peels. Bruno mentions once Kevin left Sarah was all over Pili playing with her hair and sleeping in the same bed. Zach – this is when the boys can just win out..
Godfrey brings up the argument in the storage room Wednesday night. Says it was the most heated conversation he’s seen this season. See Britt can be useful when she NEEDS to be. I’ve been keeping this for a long time but right now I am just gonna come out and say it. My gaydar seems to respond to Bruno idk why. isnt zach too ? I think he uses Ashleigh as a front, there’s no real sexual attracion. Emmett you can tell hes really straight. but Zach just seems to be hiding a secret. Mine too. He is always hugging Zach and touching him. He does not like or respect any woman. It is clear he thinks men are superior. I am very tired and exhausted by the horrible comments people make on this site. If you have a point or an opinion about the HGs, of course, go ahead and make it. I think it’s the nature of the game that people will have favourites and least favourites. I think it’s awesome that we have a forum, used by a pretty intelligent, thoughtful, strategic, and well written group of people. Really, I have found nothing else out there like this site. And to be honest, I like a good laugh, sometimes at the expense of the HGs and to the wit of some of the commentators here. But, if you are going to make a point trying to influence the opinion and reception of your favourite or their perceived enemy, let’s try to use our words/argument/points to do that. Vilifying, attacking, and insulting real people in a glass house really detracts from that. For example, “me” et all, are you suggesting that gay men don’t like women, disrespect them, and think themselves superior? Because that is what your comment suggests. I realize that you are trying to influence the readers in favour of who you are rooting for and at the expense of those HGs going against them, but your delivery completely voids any point you are trying to make by negatively stereotyping an entire identity. I would never make such comments. Britney just gave me life with that fake cry lol. I hope they keep up the act all week. Canada does love Ash and Pili. Just not all of Canada. lol Those 2 are far kinder people than Sarah that’s for Sure. Pili is a sweatheart. The game isn’t about niceness though that’s why Pili isn’t in the 90%tile in popularity. Pili is nice. But they are still both pinheads. I do hate them ! why does everyone think that their gonna take godfrey down too? Sarah won’t win the power because she doesn’t want blood on her hand, so she will not try as hard as Britt. But Britt and God are close and she has no clue that he is working with Zach, Pills, or Ash so she will take him off because he is one of her closest allies and he is actually her friend and been there for her the pass couple of days. She will put up Zach and I don’t think she will put up Pills because she probably won’t put up a girl but because now she knows Bruno is working with Zach she will put him up. Godfrey would be evicted if they leave him up plus they need Godfrey’s vote to get Zach (or Bruno) out instead of Pili as a pawn. Sarah would be smart enough to do that math, Britney I’m not so sure after her HOH. I truly believe Britney would rather still have Willow in the game right now instead of Asholeigh. Think it’s the belief that GOD has good relationships with both girls. Though it garuntees a guy goes so does a Bruno renom. They don’t want to leave a “friend” up IMO. If Bruno and Pili save Zack GOD would go. He’s definitely coming down with B.
I don’t believe they will get to pick the replacement nominee. I can see them taking down both nominees and Ashley will put up Bruno, and pilar (even though she should put up Zach). Need to get Bruno out immediately! He is the straight version of Andy from bbus, a floating rat! Blake, it is not a matter of belief. The Have Not Power has been clearly defined. The winner of the Have Not Power must remove at least one of the nominated HGs but they have the option to remove both. The HG with the Have Not Power nominates the replacement(s) but cannot nominate the current HoH or the POV holder. This is published on Global TV BBCan page in blog form and video with Arisa describing the power. You can find it for yourself in many places online. Must have missed that. Thanks for clarifying. It’s insane how many people on here would rather call you a moron than correct you. Appreciate it! You are most welcome, Blake. There are days when so much happens it is difficult to keep up. Every one of us from time to time benefit from the time and effort of Simon, Dawg and fellow posters. As far as the behaviour you see on the site, please do not take anything anyone says personally (even though some make very direct attacks on us as people it speaks more about their character and behaviour than anything about us at all). Your perspectives and input are welcome and appreciated. awww ashley ur so dam cute… ur in for some hell on weds, talking about “its way too late for secret vetoes” watch ur self boo boo its bb. Yes we are extremely jealous of Ashleigh – the most diabolical genius to ever play the game of big brother. Her intellect is beyond measure and her gameplay immaculate! Seriously just because we happen to be female we are automatically sooooo jealous of her stunning beauty therefore we are haters??? Get real. Don’t like her because she is literally not playing the game for herself but for her fickle bros before hos BB boyfriend. End of story. Poor Ashleigh, Zach shoots down her suggestion that perhaps there is a reward for being a have not this time. Ash tells him he will look a fool if there is. Then she comes out with this. Wow. Guess she doesn’t want Zach to be a lone fool. It’s not being a fool it’s her perception being in the house 24/7. That being said it’s a pretty terrible idea to think 7 left is to late. Gary season 1 just for starters. Is Bruno still on about the girls taking out the guys? Good lord! I can admire that he’s a good Floater now that Bobby is gone, but his flaw will always be his obsession with women. Godfrey would happily be the last guy in the house, because he could pick which girls to take to the final 3. I hope Bruno follows Zach right out the door. The fake cry was a move lacking class. She was literally whining like a little baby a few hours ago, now she’s just rubbing it into Bruno’s face. She should be more grateful Canada voted to give her something. She isn’t rubbing it in Bruno’s face. She’s doing it behind his back. Honestly, I don’t mind that Bruno is getting played, especially after he laughed about Sarah’s apology to him with Zach in the hottub. Sarah will be going to jury right after Zach!!! Does WeHo stand for west hollywood? lol……..ah ok…….was just wondering if you were from the states? Wondering if they already competed when the other guests were locked in HOH. I’m kind of hoping it’s Sarah that gets the power though I’m thinking maybe Britt did based on her going to DR for so long. 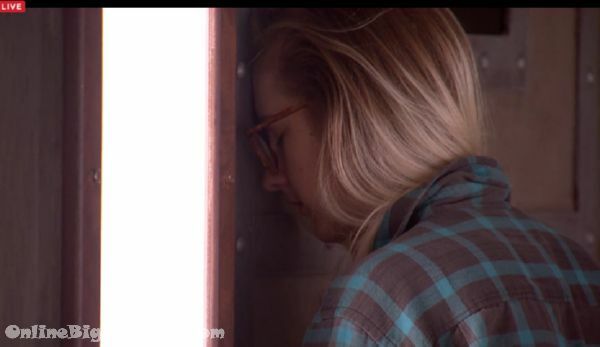 Britt might not take down Godfrey & put up Bruno/Zach so I’d rather Sarah wins b/c she’ll put up both Zach and Bruno. It’s more logical to do that b/c Bruno might vote to keep Zach and so would Pili and then Zach stays. If Zach/Bruno are on the block for sure the SBG will all vote out Zach and when Pils votes for Bruno (knowing how he holds a grudge) it might push him to try to work with SBG again. THOUGH BRUNO needs to be the target next week if they’re smart. Hope we find out soon who won it and get to see the girls celebrating. I love how Bruno is walking around with his hands in his pants holding back the laughter thinking he’s got it made. AND STILL he’s on this F3 men thing. God at least sees things clearly (and is playing a great game). Yep, it’s a no brainer ..
Sarah, Brit, n Godfrey vote out Zack! Done Deal! Simple! Who the F knows what she’ll do? Well 1 thing is certain no ones putting up Ash she is HOH. As to your point Sarah will definitely put up Zack but might actually leave GOD up by mistake thinking less blood on her hands and not counting votes. I’d say it’s a whooping 5% chance myself. She has to protect GOD who she likes far more than Bruno. As to B she likes GOD to much to leave him up IMO. If either puts up Pili I still see GOD putting Zack out. If they leave GOD on the block there is a very small chance Zack would get saved and GOD evicted perhaps 1-2 percent. i am glad they know. cant tell if the indoor lockdown means they are setting it up for that. notice howvno one will leave them alone. it isnt pity on some parts it is about blocking them from getting a perk lol. got to be the most ash and pilar spoke to them as a pair forevrr. last pic makes it look like both sarah and b are at the hot tiu so not locked in havenot room confusing . and yes….ash thought zach woul look foolish for saying what he sad but hre coming up with the specific comment about special vetoes is priceless. i think god will be pulleyoff because he is a vote. if left up the votes are down to bruno…ut if both bruno and zach are up it is far more likely that god would look at who takes him off and wht they want when voting. plus if they wanted zach out more likely he would vote zach out. bruno already showed he would keep zach so givin him a vote would be countrproductive. plus in an event lik this where he failed to use a similar one it would b good tv if he wasprevented from having any say over who goes homand running the risk himself. plus he hasnt been up before has he? so yes put him up with zach to saow him that hsd he not used the veto to save zach he wouldnt be up there with him. What a farcical season!! This is why BBCAN can never compete with BBUS. It’s just amateur hour here with BBCAN, picking their favourites, bringing unfair twists to make sure their favourites stay. BBUS rigs but not this late. The only thing that’s left is for Sarah to win another power and waltz her way to F2. I called it weeks ago that Sarah will get some special power and lo and behold. I know people are gonna downvote this but how unfair is this? How would you feel if you worked hard all season and then you get screwed out of 100k ONLY due to some bs unfair twist. At least let everyone have the opportunity to get the power and not just 2 specific people. If I was Zach, Ashleigh, Bruno I would feel seriously pissed off. I am no Zach fan, but I feel this is just screwing him over for no apparent reason. Also, whats with people’s obsession with having a girl win or having girls unite? Aren’t we all equal boys and girls? Why bring in gender into this? Feminist hypocrisy at best. Example 1 – Sindy calls Bobby an idiot and can get audience to laugh but imagine Bobby calling Sindy something, knives would be out and he would be labelled a misogynist and a woman-hater etc. Example 2- People hate Bruno now for fighting with Sarah, but Sarah instigated the fight and she also yelled back so why the double standards! Apparently, the women are golden this season, at least according to the people that comment here. Be warned: because you said something, anything, against the women and in support or defence of a male, you will now and forever be labelled a misogynist. Don’t worry about context or gameplay, or the actual reality of the situation, just worry about whether you dare say something about the girls, namely Sarah. People keep forgetting in the F4 it is not always POV winner who decided who goes home. It only happens when a non-HOH HG wins POV. If the HOH wins POV the not-nominated HG has sole vote to (despite not winning POV) evict. 2.1 HOH can backdoor the not nominated HG. The HG taken off the block holds sole power to evict despite NOT winning veto. IDKidk where the notion came from in the F4 “veto holder holds sole power” to evict it s not always true. If HOH wins veto that s the other scenario. Read the comment again. I said BBUS rigs it but not this late when there’s 3 weeks left and you only give 2 people the chance to get such a power. Also, BBUS brings people back when they are sequestered not the bs with Cindy or Gary how they brought him back from jury into F5…IF thats not unfair and ridiculous then what is? show me a season that has 7 people in the house with 3 weeks left. twists in bbus seasons with 7 house guests remaining aren’t unusual. The number of houseguests vs. the number of weeks has been whack since day one. i’ll be honest with you: I hate production twists no matter when they happen. They’re going to happen. They’re planned at the beginning of the season. Unless the eviction orders are predetermined there’s no predicting who will benefit and who will suffer. With a twist like this, production knows exactly who this will help and who it will hurt. Production knows who the 2 fan favorite players are, and this twist helps them only. I don’t mind the twist itself, but give everyone in the house an equal chance of winning it. When production meetings began, a plan would have been made for what twists they were going to throw into the mix. That’s long before filming began. they would have created a timeline that said week one we’ll have a Canada vote, week three we’ll have a twist veto, week seven we’ll have a triple because we started with 16 for a 10 week show, after the triple we’ll throw in the secret power. it wasn’t determined last week. it’s been in the books for over two months. yes, now they know who it will help. when they made the plans for the season, they had no idea. I Agree, . . but . . I agree with everything you have pointed out to a certain degree. But what I have an issue with (and it has nothing to do with any of your points or any of the issues you raised), forgive me, but I am attaching it to this discussion because it is an extension. When the men/ bros/guys group together people start calling them misogynists and when the girls group together it is about feminism. One is a very negative label about hatred, the other a positive one about equality, regardless of how firm or solidified the alliances, if any, are. The real context is that this is about gameplay and drawing lines and trying to find a context or framework for the contestants to understand where they stand or position in the game. Did anyone notice Emmet say on the sideshow that he and Pilli are neighbours? I’ve also heard that Pilli met Jillian & Emmet prior to casting. The funny thing is, this may be the worst thing to happen to Sarah. If there was no power Brit would go home this week. This would break up the pair, which Ash and Pili want. Leaving Sarah all by herself. Ash and Pili would go after Bruno and God next. If Zach goes home this week, everyone would still want the pair out. And Sarah would most definitely go first. Why is Ash even playing? Point is there seems to be a major crack in the Pili/Ash camp. Pili is starting to grow on me … she’s becoming quite the little gamer? and says … It’s to late in the game for that. Pili is a nice surprise. We saw a hint of her growing into the game during her HOH (unfortunately Kevin squelched it every chance he could). And now she is thinking independantly…and now Ash squelches it. You forgot the factor that Ash and Pili are as dumb as rocks and are like women from the 1920’s bringing sandwich to their man. if ever Pilar gets a backbone and think for herself and make a smart alliance and stay the nice gal and play and win a true competition and, and , and , and……………I would like her to win. Godfrey is the best of all that is left. Have to wait and see how it all pans out.